Stocks, Bonds & Politics: Bought 100 MLPA at $14.75-Roth IRA/Gold: MTY and MOL/Pru Bond Maturity/Added to PAUDX/American Commitment-Another Koch Super PAC? Bought 100 MLPA at $14.75-Roth IRA/Gold: MTY and MOL/Pru Bond Maturity/Added to PAUDX/American Commitment-Another Koch Super PAC? I published a post on Sunday discussing the different prices used by brokers for reinvested dividends. Stocks, Bonds & Politics: Differences in Prices Among Brokerage Firms for Reinvested Dividends That post was originally part of this one, but I thought that it needed to be segregated. I hope to have more on this subject later this week. I was shocked by the percentage disparities in price. I probably have 20 or so examples so far that I will highlight. I have not found a single instance where two brokers had the same reinvestment price. 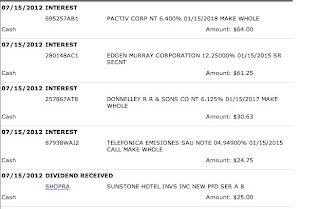 I noted in the comment section to the preceding linked post that Fidelity did charge me the $.40 cent cost ($.004 x100 shares) to secure the 15% tax rate for the recently paid FTE dividend. 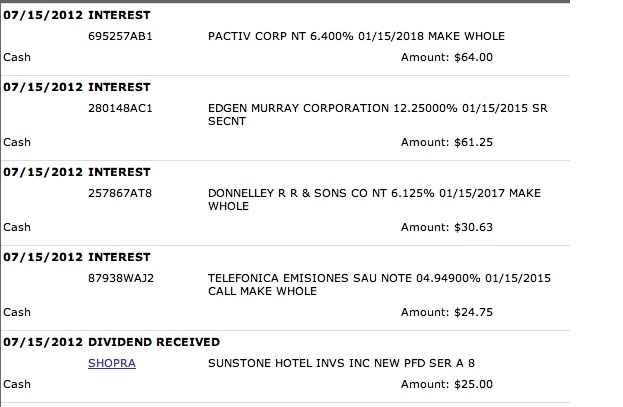 Sharebuilder, which withheld 30%, had a $2 fee, while Fidelity charged me $2.40. I would add that Sharebuilder also had a higher reinvestment price than Vanguard for the reinvested FTE dividend, and Vanguard also withheld 15%. The robust rally last Friday made no sense to the LB. The DJIA lost ground for the first four trading days last week and the rally last Friday left the index up .04%. The first four days made more sense to LB, given the big picture issues. RB added that is because "Lame Brain only see what is, not what can be". This senior bond is rated "A" by S & P. To secure a 5.6% current yield from a "A" rated bond, I would have to go past a 2030 maturity date. This article at Seeking Alpha, published in 2010, provides historical data on U.S. tax rates applied to dividends and long term capital gains. (Since the article was published in February 2010, it does not include the extension of the Bush tax cuts until the end of this year). The tax rates are capped at 15% until the end of this year. The dividend tax rate will rise to the investor's highest marginal tax rate on 1/1/13 unless there is an agreement to extend the qualified dividend rate. A number of doomsayers are arguing that stocks will crater in the event the 15% maximum rate on long term capital gains and qualified dividends are allowed to expire at the end of this year. Between 1/1/1982 through 12/31/1997, the S & P 500 grew an annualized rate of 17.91% with dividend reinvested and unadjusted for inflation. Annualized Returns of the S&P 500 During that entire period, the tax rate on dividends was the same as interest income, the highest marginal rate of the taxpayer. There are obviously more important factors at work. The long term capital gains rate, which is now at a 15% maximum, was at 20% between 1982-1985; 33% between 1986-1989; and 28% between 1990 and 2000 when it was reduced to 20% just in time for a market crash. What has been the return of the S & P 500 since the Bush 2003 tax cuts? Between 1/1/2003 through 12/31/11, the annualized return with dividends reinvested was 6.12%. During the previous long term secular bull market in stocks, lasting from 1950 to 1966, the long term capital gain rate was 25%. For most of that time, the top marginal tax rate was over 90%-ridiculous. With small exemptions, most dividend income would have been taxed at the highest marginal rates between 1954 through 1965. For the third time this year, S & P cut its rating on J.C. Penny debt. I own one bond that was recently bought and may buy one more. The latest cut was to B+ from BB-. TEXT-S&P S & P also provides a recovery rating in the event of a default. The current recovery rating for JCP indicates a "meaningful (50%-70%)" after a bankruptcy. The current annual period for MOL ends on 11/19/12, MOL Prospectus, and that may be important in the event Merrill's prediction proves to be prescient. MTY has a 3% minimum coupon and MOL is lower at 2%. Starting values for the gold price can be found using the London P.M. fix found at Kitco Inc. - Past Historical London Fix. While the future is unknown, I doubt that either MOL or MTY will suffer a Maximum Level Reversion during their respective current coupon periods, which has happened in the past. That violation triggers a reversion to the minimum coupon irrespective of gold's rise above the starting value on the closing date. The issue in the current coupon years for both securities is whether gold prices will trigger a rise in the respective minimum coupons by the closing dates. Self-styled conservative PACs are, for the most part, associations of rich people who want their taxes reduced and regulations on their businesses eliminated or substantially reduced in order to increase their profits. Those folks know that GOP politicians will do their bidding. "Americans for Prosperity", for example, was co-founded by David Koch. "Americans For Prosperity" and the KOCH Family A article in The New Yorker explores how the Koch brothers are using their wealth in order to shape America more to their liking. Koch Industries is a large American multinational corporation that engages in a number of businesses that have pollution issues (chemicals, refining, energy). A new PAC, called "American Commitment", was started by Phil Kerpen who worked for Americans for Prosperity" for five years and the "Club for Growth" prior to that. The Washington Post To achieve the objective of lower tax bills for the super rich, it would be counter-productive, to say the least, for the PAC to disclose its donor lists and confess their true motive. Instead, the PAC will seize on whatever issue that is viewed as likely to influence uninformed and easily manipulated voters. Telling the truth is not one of their "conservative" values. In the current election cycle, that issue is Obamacare. The latest lie about Obamacare, frequently mimicked by GOP politicians, is that it constitutes the biggest tax increase on the middle class in history. PolitiFact gave that claim, made by the PAC "American Commitment", a "Pants on Fire" rating. American Commitment included that falsehood, among others, in attack ads against Senator Bill Nelson (D-FL). PolitiFact | American Commitment's file Before telling its falsehoods in the ads, American Commitment states that it is going to give the voters facts about Bill Nelson. This organization would not respond to Politifact's request for substantiation. 1. Added to the Mutual Fund PAUDX last Wednesday (see Disclaimer): I am not going to get rich investing this fund. I view PAUDX as a conservative allocation fund. I decided to add to my position after noting that the fund has held up well during market downdrafts. Last Tuesday, the net asset value was unchanged when the S & P 500 declined .81%. The net asset value rose 2 cents last Wednesday when the DJIA declined by .38%. I am actively looking for investments that have a negative correlation with stocks or a low positive correlation. My original investment was $3,000 about one year ago. Item # 2 Bought PAUDX/Unusual Allocation Funds While that shares are now worth over $3,200, that value is entirely due to the total amount of reinvested dividends. I am down slightly on the shares. PAUDX has a five star rating from Morningstar. The fund manager is the highly regarded Rob Arnott. This kind of fund is likely to be left behind in a long term secular bull market for stocks. The manager's goal is to beat CPI by 6.5% per year annualized over a market cycle. PIMCO All Asset All Authority Cl D (PAUDX) rose 6 cents last Friday to close at $10.58. 2. Gray Television (own 1 2nd lien bond: 2015): Gray announced last week that it expects second quarter revenues to be 9% higher than the high end of its previous guidance. The preliminary revenue estimate for the second quarter ending 6/30/12 is now $175.365 million, up 20% from the $145.943M reported in the 2011 second quarter. This company will benefit from election related advertising this year. The common shareholders were not impressed, as the shares (GTN) declined 2 cents in trading last Friday to close at $1.51. A positive view of the common shares can be found in this article published by Zachs. 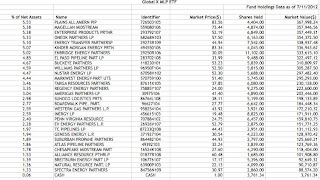 The common shares, GTN, are in my 200 stock monitor list for possible Lottery Ticket purchases. I have not bought any shares yet. The current stock price suggests that there is a sliver of equity underlying a mountain of debt. I do own one second lien bond maturing in 2015 and have an unrealized profit of close to a $100. Bought 1 Gray Television 10.5% Second Lien Bond Maturing 6/29/2015 at 95 If I could sell that bond for 105 or over online, I would probably do it, but there have not been any bids wiling to accept 1 bond. I view this second lien bond to be high risk, currently rated at CCC+ by S & P and Caa2 by Moody's. When I originally purchased the bond, S & P had a CCC rating on it. There was an upgrade of GTN's debt last April. TEXT-S&P I did not notice the upgrade until I started writing this section. I have access to the S & P bond reports from Fidelity. The more senior secured debt is rated "B+", two notches higher than the 2015 second lien bond. The "corporate credit rating" is now at "B". In the event of a default, S & P estimates that the recovery for the second lien owners would be negligible at 0% to 10% which may be too pessimistic in my opinion. Remember what happen to my 1 Reddy Ice second lien bond? It was exchanged for 43 shares of newly issued common stock in a bankruptcy reorganization. Maybe, with a lot of luck, Reddy Ice will be more successful this time around; will successfully complete an IPO at some unknown future time; and my shares will eventually cross the $20 mark at some distant time before my demise,allowing me to break-even on my investment. Then again, maybe the Sun will go SuperNova tomorrow, and I will not have to be concerned about the value of second lien bonds in bankruptcy anymore. Please note that I owned 1 Reddy ICE second lien bond and 1 Gray Television second lien bond. Both are almost completely meaningless to me, in the overall scheme of things. The main disadvantage of MLPA, compared to AMLP, is its thin trading volume and a relatively high bid/ask spread. I can cure that problem by checking the sponsor's website for the latest NAV information and then making a judgment on the best price for a day limit order. With Fidelity and Ameritrade, I can enter a All or None (AON) order for a 100 share lot. My Roth IRA account is currently at Vanguard, which requires an order for more than a 100 shares to trade with a AON restriction. Whenever I can not enter the AON designation with a limit order, I am concerned about a partial fill when dealing with thinly traded securities. I am tailing about a 1 share fill on a 100 share order, which has happened to me. If the ask price is acceptable to me, I would just enter a limit order at the ask price. I saved five dollars by entering a 100 share limit order with no restrictions for MLPA and received a fill for the entire 100 shares. Who knows, I may need that $5 in 40 years. 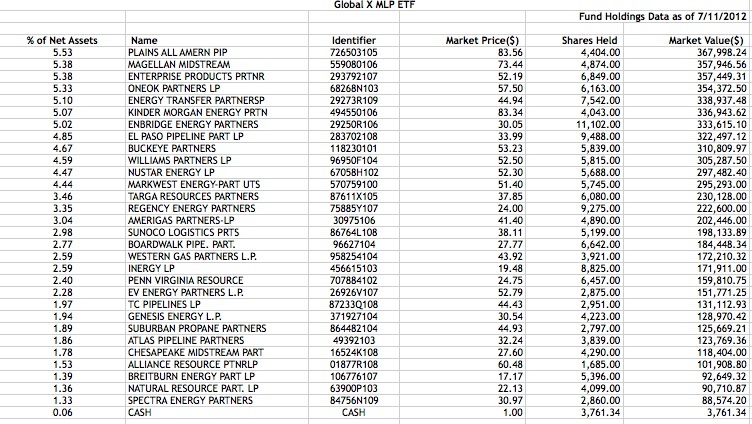 This article at the ETF Database summarizes the MLP ETFs and ETNS. In that article, the author mentions that MLPA has an expense ratio of .45% compared to the category average of .82%. The expense ratio would be the major advantage for this ETF compared to other ETFs and ETNs in this sector. This is a new fund. The fund will pay quarterly dividends, and has made only one distribution to date, a $.174105 cent per share dividend paid on 7/12. That may have not been for a full quarter. Until the fund makes four quarterly payments based on an entire quarter's earnings after expenses, I do not know my dividend yield, but would estimate that it will end up being slightly over 6% at my cost. I also like to avoid ETNs whenever there is an ETF available. The ETN subjects me to the credit risk of the issuer in addition the risks inherent in the securities owned by the fund. This previously referenced WSJ article discusses some of the disadvantage and advantages of ETNs and ETFs for this category. The ETF has an issue which involves holding cash for estimated tax liabilities according to the author of that article. I understand that issue better after reading MLPA's Prospectus at page 5.